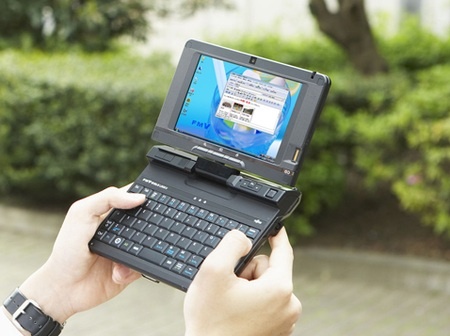 Fujitsu is introducing a 5.6in ultra portable computer. SERIOUSLY small, seriously portable. Don’t get salavating yet though, it’ll only be released in Japan. This ultra-tiny machine has a 5.6in display that’s capable of 1280 x 800 resolution. The screen comes with an integrated webcam. The U/B50 has 802.11n Wi-Fi and Bluetooth on board – and 3G communications too. The machine sports an HDMI port so you can hook it to your TV (just in case your eyes get destroyed by trying to work off of a 5.6in screen. The U/B50 runs Windows Vista, but inly comes with a gig of Ram. I’m unsure how comfortable I’d be running Vista with just a gig. Sure you CAN do it, with all the fancy visuals turned off but I’d question performance. Had drive options include 60GB, 100GB or 120GB capacity. It also comes in a 64GB solid-state drive model. Prices on the thing aren’t to bad for the low end model if you really and truely need an ultra-portable – $1,134. However, but the time you crank it out and get the SSD model you’re sitting at around $2,509.